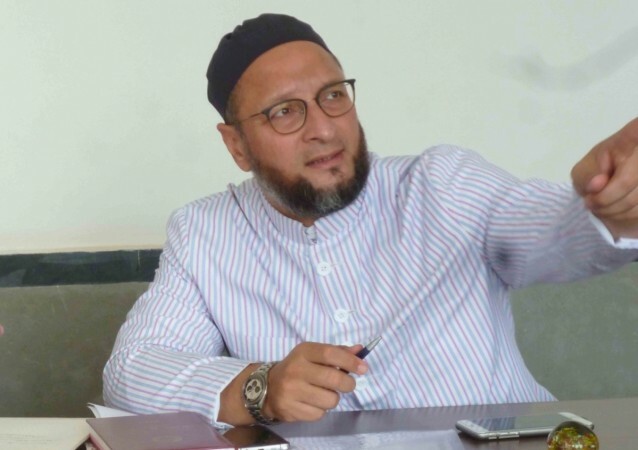 Owaisi claimed that both BJP President Amit Shah and Congress President Rahul Gandhi want to "stop" his party in the December seven Assembly elections to the 119-member Assembly. AIMIM President Asaduddin Owaisi on Wednesday ruled out his party joining the TRS government in the event of it returning to power for the second term in office. The Hyderabad Lok Sabha member said the TRS would form a government on its own. "No, we will not join the government. I am pretty much sure that the people of Telangana will bless KCR (as caretaker Chief Minister K Chandrasekhar Rao is referred to by many) again. He will form the government. We will not join the government", he said. In any case, there would not be any need for AIMIM to join the government as TRS would get a majority on its own, Owaisi said at a "meet-the-press" programme organised at Hyderabad Press Club. Responding to questions, he claimed that both BJP President Amit Shah and Congress President Rahul Gandhi want to "stop" his party in the December seven Assembly elections to the 119-member Assembly. "Rahul Gandhi and Amit Shah are working together against AIMIM", Owaisi alleged. AIMIM, which won seven seats in the 2014 Assembly elections, has fielded eight candidates this time. Owaisi said his party would not only retain the seven seats but also win in Rajendranagar constituency.TRS like the BJP is going it alone in the Assembly polls. Whereas, the Congress and TDP are part of the 'People's Front' which also comprises the CPI and Telangana Jana Samiti.